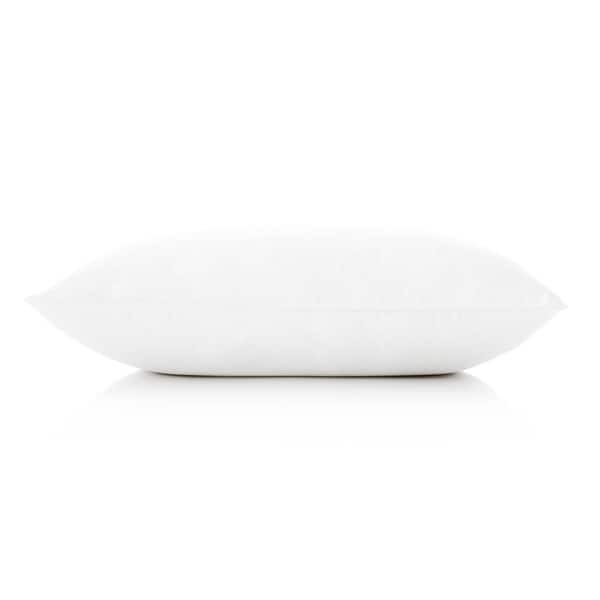 Give your sleeping experience an upgrade with this comfortable and soft, cotton and down fill alternative pillow. The classic pillow features a 100-percent cotton cover with piped, double-stitched edges that give the pillow durability and style. The down alternative filling is hypoallergenic, making it ideal for those prone to allergies. Fluff and pat the pillow to create a custom sleep surface that is perfect for you. The pillow has all of the benefits of down without any of the downsides, such as odors, allergens or sharp quills. Lofty and comfortable, this pillow has a cloud-like comfort that will take your bed from okay to exceptional. Standard: 16" x 25" x 6"
Queen: 16" x 29" x 6"
King: 16" x 35" x 6"
What a pillow! The first couple nights I used this pillow have been the greatest night sleep I have had in a while. The pillow is very comfortable and seems to be very very well made. I like to sleep on my belly and hold my pillow between my arms and I didn’t have any issues with this pillow at all. This is the 1st pillow that I did not have to use 2 pillows. It stays cool at night and is the perfect firmness. I stay asleep without having to re-position my pillow all night. Absolutely comfortable and I get a wonderful peaceful nights sleep. Definitely recommend this pillow! I am excited to have a pillow that I can actually sleep on. I slept a whole 7 hours last night. It was amazing. My old pillow was so soft and I was getting neck pain. This one is fluffy and soft. I really like that it is made of down material. I am sleeping so much better. It came packaged rolled up. So, I had to fluff it up. But, it works great. Good purchase! I love this pillow! Comfortable and what I wanted! It’s okay. Very puffy, which is too much for me. I’ve dropped down to a soft pillow, and those seem more my speed. This is decent quality for the price. My only issue is with the thickness. I feel like Medium should be medium filled, not so puffy. I bought this as part of a bedding gift for my granddaughter. She is very picky about her pillows but she absolutely loves this one. She said it's the perfect pillow - just right not too soft or too hard. So glad this works. Great pillow! Not too hard, not too soft. Very comfortable. This is such a soft and comfortable pillow! The padding is great and it sure makes for a great night sleep! Will be getting a second one for sure. Great Pillow, super fluffy and doesn't have a odor. This is a good sized pillow that doesn't make me sweaty either... I really like it. This pillow is so comfortable. I love soft and fluffy, and this is perfect and I don't have to worry about getting stuck by the pointy feather ends. Couldn't be more satisfied. Bought this pillow for decorative reasons but used recently when I had a bad cold. It kept my head up comfortably and stayed supportive. Glad I them handy. Arrived very quickly. It is soft, but not too soft. The fabric is also soft. I think it is going to be a great pillow. I got if for our guest room, because I felt like it would be kind of middle of the road and not too soft or hard. Love this item and would buy over and over again. This would make a great Christmas present. Thanks overstock for quick shipment and excellent quality for every purchase I have had already with you. Ps I do read most all the reviews before I purchase which I would recommend to everyone.